LONDON, April 13, 2018 /3BL Media/ - In 2017, FCA continued to transform our sustainability commitments into concrete actions that aim to create long-term value responsibly. We recognize that our environmental and social activities affect not only our aspiration to grow the business but also our determination to positively affect our world. 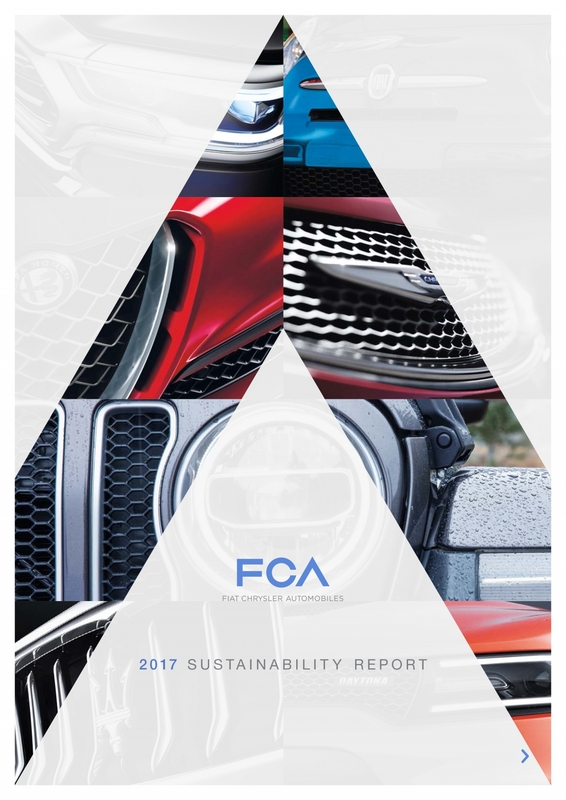 The 2017 FCA Sustainability Report, released today at the Annual General Meeting of Shareholders, communicates to stakeholders the most relevant social, economic and environmental achievements and long-term targets addressed by the Group. In 2017, we shipped 4.7 million vehicles to customers around the world, while continuing to reduce the environmental footprint of our operations. Over the past seven years, we decreased CO2 emissions by 33%, water used by 37% and waste generated by 58% per vehicle produced in our mass market assembly and stamping plants. We engaged our workforce in our activities, and in 2017 collected more than 2.8 million suggestions from employees on potential improvements to products and processes. Work-related injuries at plants worldwide decreased for the 11th consecutive year. We continued our efforts to develop vehicles responsibly through dedication to efficient powertrains, improved aerodynamics, weight reduction, safety and quality. Our actions to improve vehicle fuel efficiency and reduce vehicle CO2 emissions included the launch of the eTorque Assist mild hybrid technology on the all-new Jeep Wrangler. FCA strengthened our collaboration with Waymo, Google’s self-driving car company, to integrate self-driving technology into Chrysler Pacifica Hybrid minivans and support the launch of the world’s first driverless ride-hailing service. We are exploring other ways through which we can provide autonomous vehicle services to our customers. FCA supported the communities where we live and work by committing more than €25 million around the world in 2017. Our employees volunteered more than 240,000 hours to nonprofit activities during work time. FCA is conscious of the effect that our activities and products have on society and the environment, and of our role in developing solutions to reduce our environmental footprint. Our global activities support the transition toward a circular economy and contribute to achieving the aims of the United Nations Sustainable Development Goals (SDGs). This press release contains forward-looking statements. These statements are based on the FCA Group’s current expectations and projections about future events and, by their nature, are subject to inherent risks and uncertainties. They relate to events and depend on circumstances that may or may not occur or exist in the future and, as such, undue reliance should not be placed on them. Actual results may differ materially from those expressed in such statements as a result of a variety of factors, including: volatility and deterioration of capital and financial markets, including possibility of new Eurozone sovereign debt crisis, changes in commodity prices, changes in general economic conditions, economic growth and other changes in business conditions, weather, floods, earthquakes or other natural disasters, changes in government regulation, production difficulties, including capacity and supply constraints, and many other risks and uncertainties, most of which are outside of the FCA Group’s control.